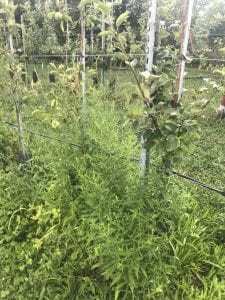 One of the research projects at the orchards that I have assisted with is collecting weed samples in the orchard. 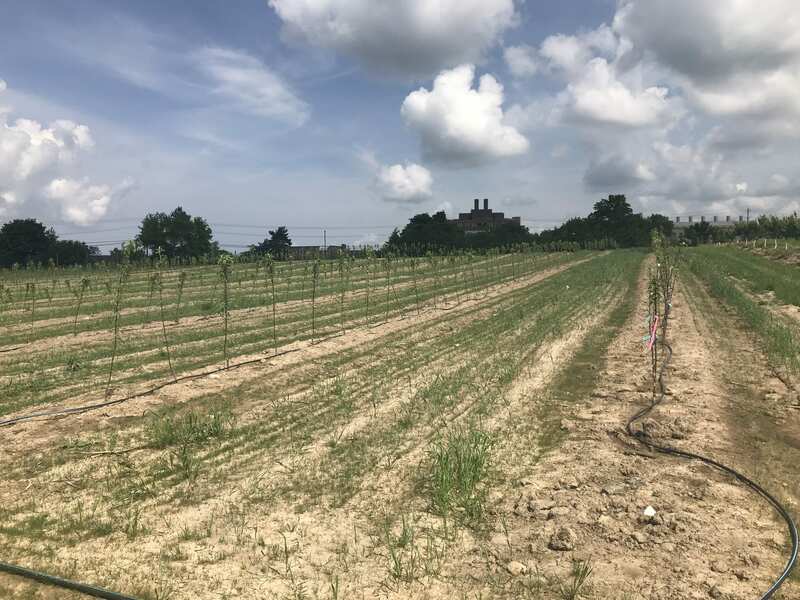 This research project is being conducted under Honey-crisp trees grafted on a Bud 9 rootstock managed in an organic system. 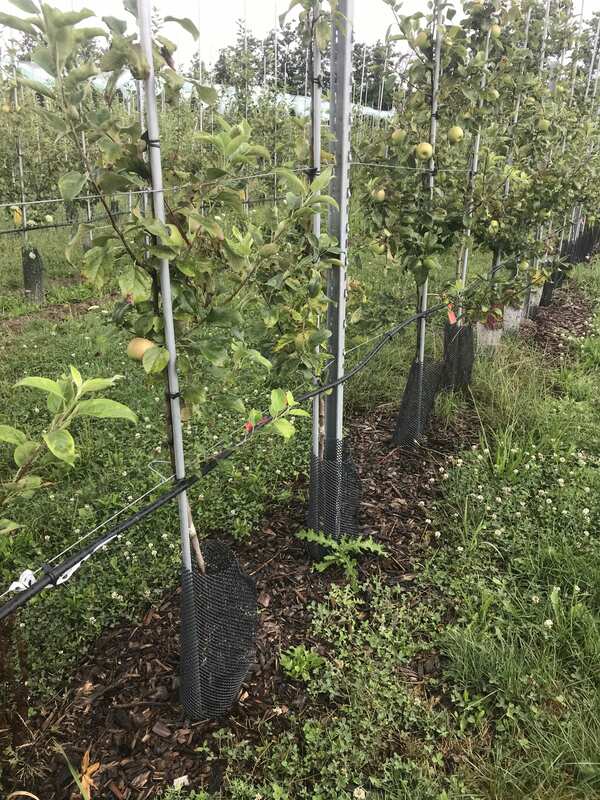 The bud 9 rootstock is cold-hardy and has a dwarfing effect on the honey crisp variety, and the trees are planted onto a high density system. 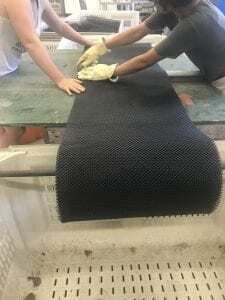 Research for this project started in 2016, and contains different treatment practices for weed control and soil health. 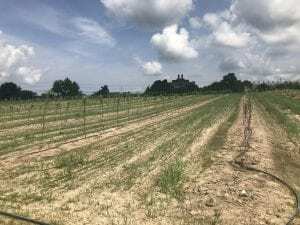 The treatments include mulch, tilling with an implement by Harris Mackey called the Wonder Weeder, weed whacking, 2 organic sprays (Suppress and Final-San-O) and a control area. 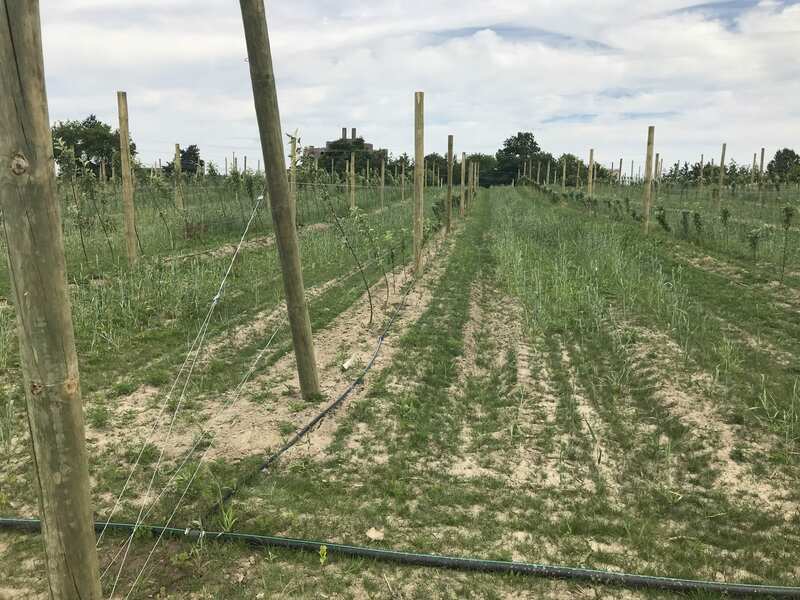 Ultimately, the research project aims to see which weeds grow under different management systems, the biomass of those weeds, which system yields higher soil health levels, and the overall horticultural performance of different management systems. To collect data, we first place square outline of PVC pipes on the ground between trees. 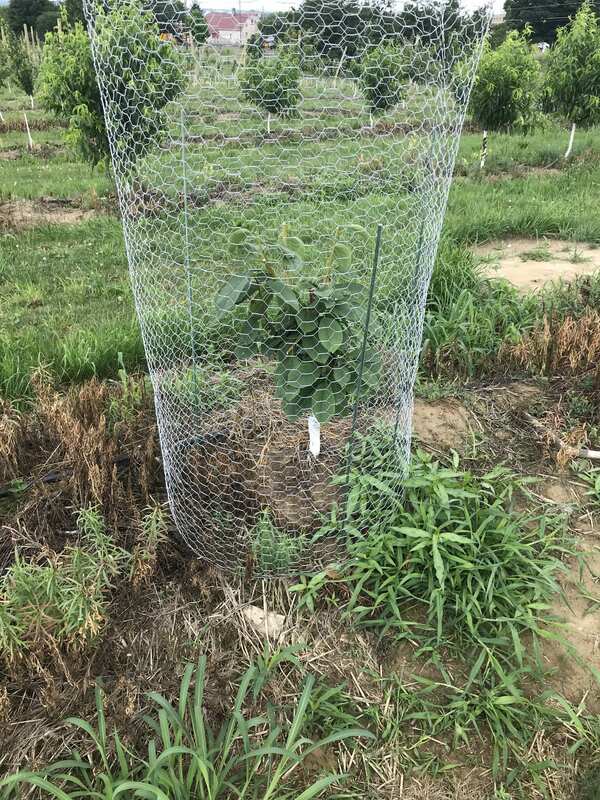 After the target area is defined, my supervisor would take a picture of the area to collect data on the percentage of weed cover in the plot. Next, we cut the weeds at surface level, and then sort them out into bags labeled with their variety. We would then dry the weeds and weigh them to note the biomass levels. I have not tested soil health, but soil samples are sent to the Soil Health lab at Cornell to assess this data point. This process is repeated every month to see the change in varieties and repeated across many rows in the orchard to account for different factors that could be present across rows and trees. 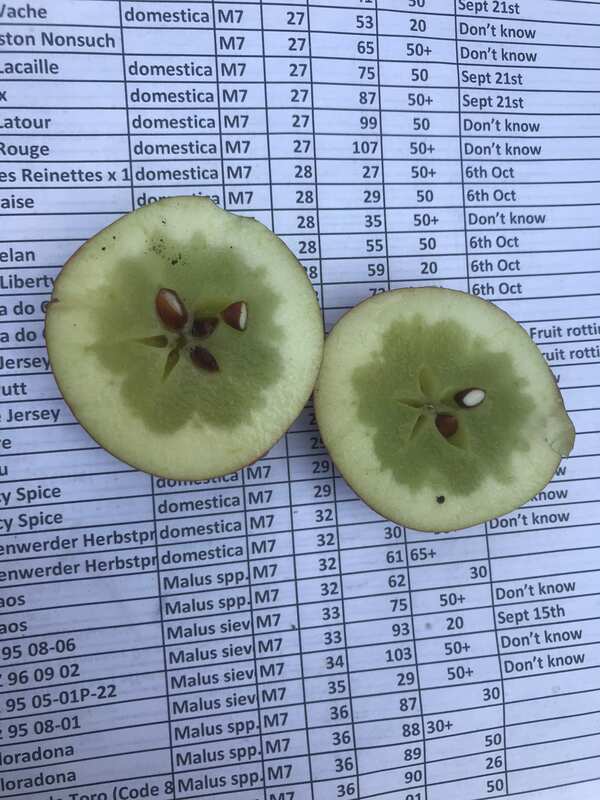 This diagram shows what area we would harvest weeds from in the orchard. Some plots have much more weeds than this and many more varieties. 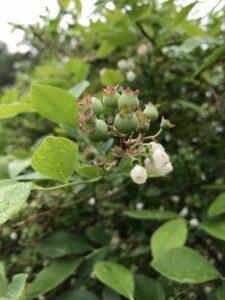 This research project has been useful in my ability (or lack thereof) to identify weeds that grow in the area! This plot looks like could be part of the organic spray section, but I am unsure which spray was used in this area. 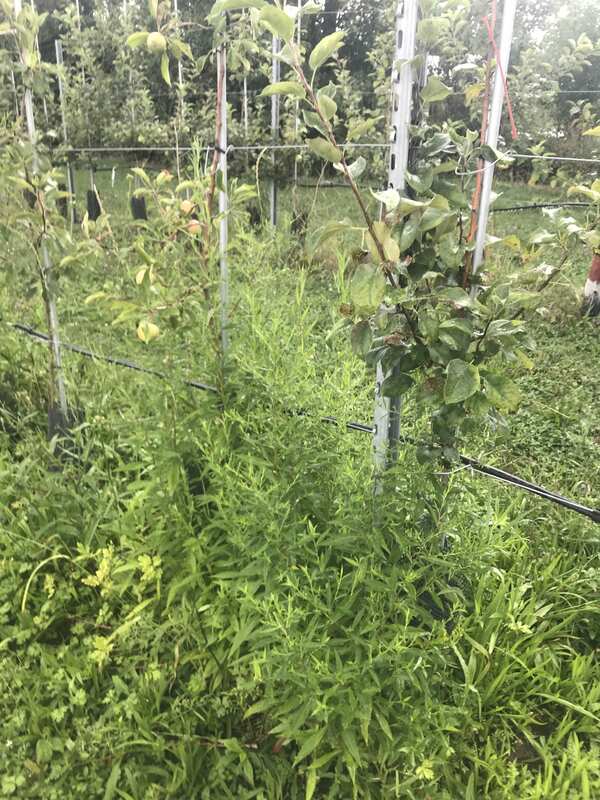 In this picture, you can see the difference in weed biomass and species that are present in the research trial. I would guess that this section would be in the “control’ category, meaning that we have not had any weed control interference in the plot. These weeds are most likely competing with the trees for nutrients and could grow to be very unruly if left alone. The following picture is the mulch section of the trial. From my observations, this treatment seems to prevent weeds the best when compared to the other treatments. 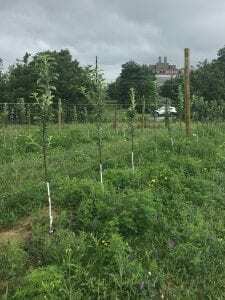 The next picture is of the “Wonder Weeder” plots. 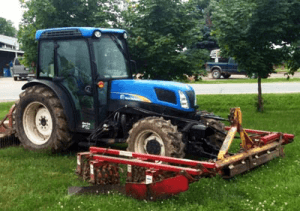 This cultivation implement is attached to the front of the tractor, and the speed is dictated by the speed of the tractor. Cultivation with this tool is fairly shallow, so the soil health levels are not majorly impacted. My supervisors like this tool for orchard weed management, because it allows them to get close to the trees and see the area they are tilling from the front hitch attachment. I have also attached an image of the implement to get a better idea of what it looks like. After we weigh the weeds, we input the data into a excel spreadsheet that is formulated to allow my supervisor to see how much of the biomass was composed of which species. 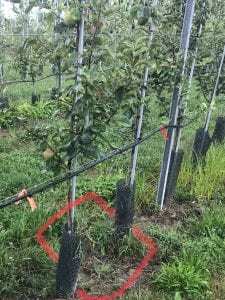 Hopefully later, they will be able to share scientific-based recommendations on which weed control method prevents certain weeds and total weed cover for organic apple orchards! 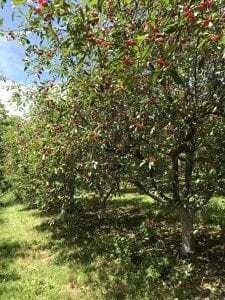 While the Orchards Store has many tasty apples and cider for sale, much of my work with apples this summer has been on something that the store does not offer–hard cider apple varieties. 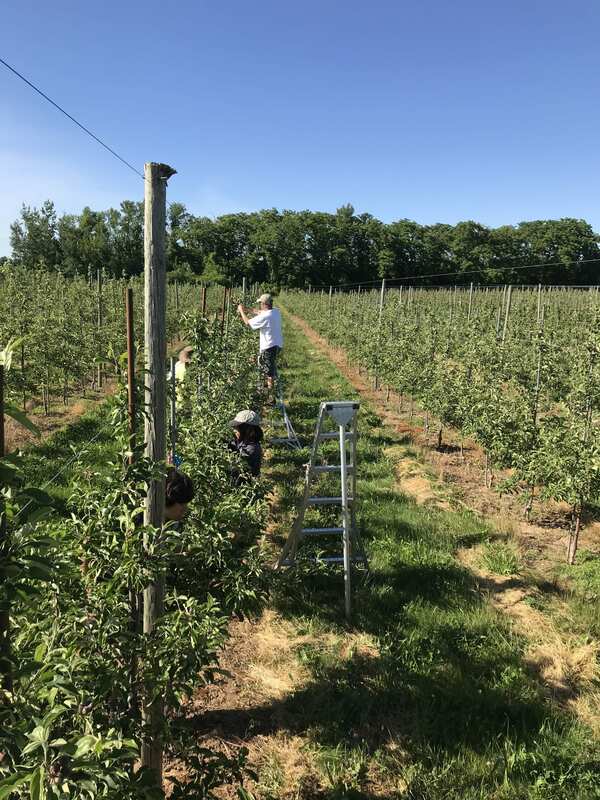 The Orchards has multiple plantings of apples that might not taste the best if picked right from the tree, but, if given time, will make excellent hard ciders. 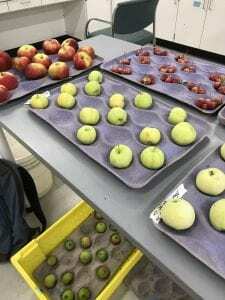 These apples can make a variety of cider tastes, as each have differing levels of volatile compounds. The apple varieties I have worked with come from all across the world, like England’s Dabinette, United Kingdom’s Brown Snout, and the United State’s Golden Russet. 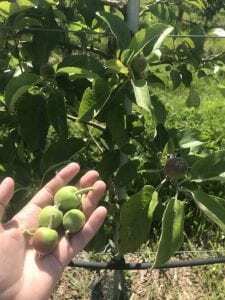 The newest apples at the Orchards are from Spanish varieties, and have been a long work in progress, as many new varieties have to be quarantined before they are allowed to be planted. 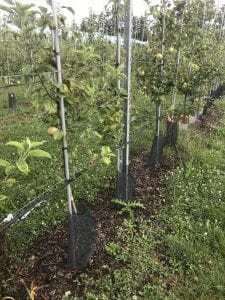 When I first arrived at the Orchards, the staff had recently planted a new block of cider apples. 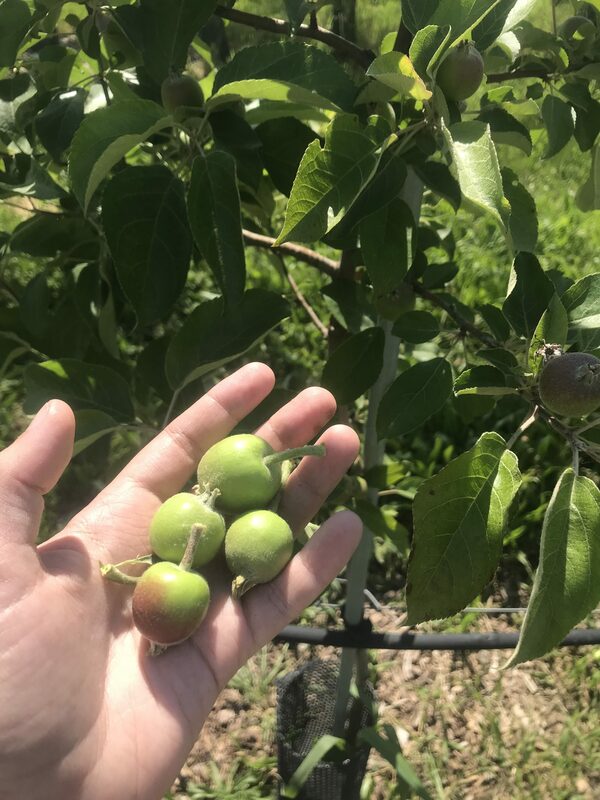 These apples are different than the previous cider plantings, because the new block was planted with Spanish style cider varieties like Blanquina Geneva and Raxao Geneva. 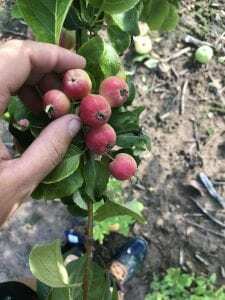 These new varieties of apples will produce a different tasting style of beverage than what is currently sold on the market. Draft magazine calls the Spanish cider style “funky, tart, smoky and sometimes challenging ciders.” Cider is often measured in terms of tannin and acidity, and hard ciders are often categorized as bittersweet (high tannin, low acidity), bittersharp (high tannin, high acidity), sharp (low tannin, high acidity), and sweet (low tannin, low acidity), depending on the content of each volatile. The Spanish style hard cider is made from apples with different levels of tannins and acidity, and most varieties have high acidity levels. 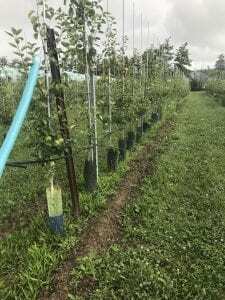 It has been fun to see the progression of a new planting, and all the work that goes into planting an apple field. I’m eager to come back in future years and see how the fruit tastes, and learn firsthand how different the Spanish style is from the current style that is popular in the United States. In the mean time, here is the work I have been doing on the new planting. At first, the trees looked very small and weak in this open field, but not for long! 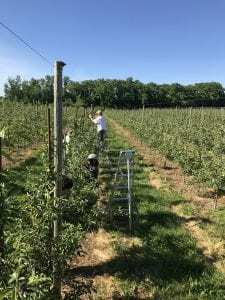 The Orchards staff and my fellow interns got to work building trellising for the trees, so they could stand up in Ithaca’s weather. The wooden posts were pounded in with a special machine, and will support the trees throughout their lifespan. Next, we painted the tree trunks white to prevent winter freeze injury, and then added rubber bands and clips to keep the trees in place. We also marked a certain height on the tree with red paint, so staff can go back in and measure the diameter of the trunks for research projects. In this picture, we are cutting tree guards to keep out rabbits and other animals during the winter months and prevent damage to the trees. Lots of work goes into planting and maintaining trees, but I’ve enjoyed working hands on with the new planting! 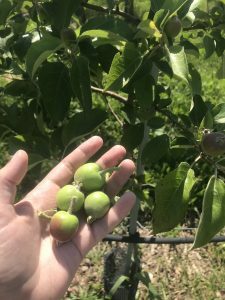 While Johnny Appleseed may have given many people the view that apples can be planted anywhere and maintain their growth perfectly for many years, this is unfortunately not the case. Apples are susceptible to diseases, pest pressures, and, if left alone, may not bear perfect-or hardly any-fruit every year. 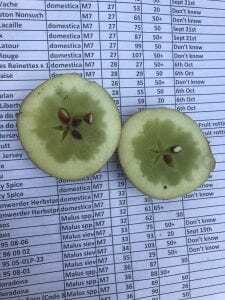 Growing up on a wheat farm, I knew about spraying fungicides and pesticides, but I never thought I would run into the problem of the crop having too high of a yield. 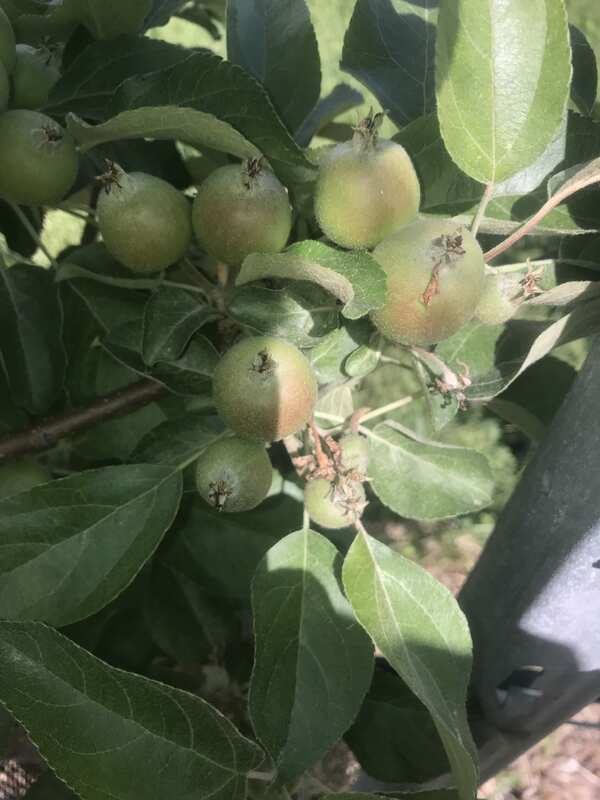 Apples run into issues when they produce too much fruit, and can often fall into a biennial fruit bearing systems, meaning that they will produce a high volume of fruit one year, but none the next. Many farmers spray chemical thinners when the trees are pollinating, which allow the king bud (the first bud to emerge) to remain, but prevents the subsequent buds from becoming fruit. At the Orchards, one of the research projects is focused on achieving the ideal crop load for producers, while preventing the tree from taking on a biennial growth pattern. 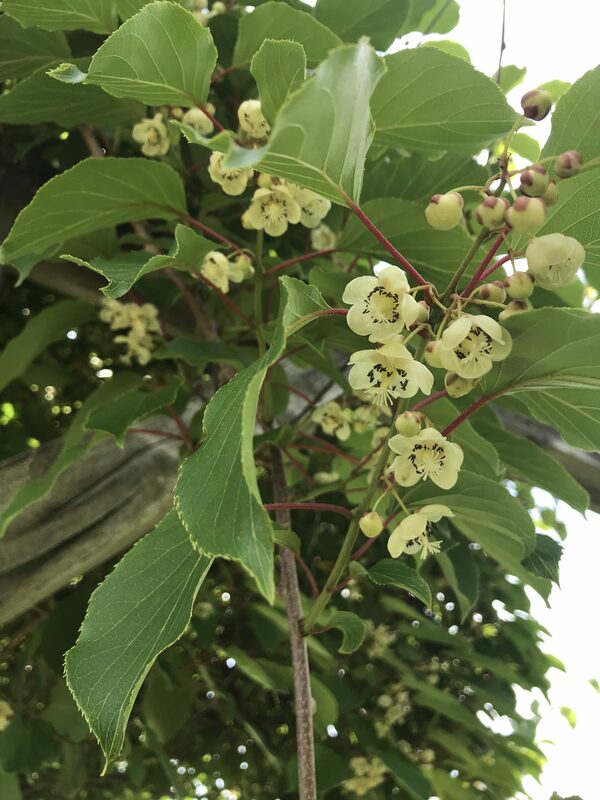 Here is an example of a tree that has several fruit per cluster, which we (the interns) would then thin down (remove fruit from the trees) to a single fruit per cluster, ideally the king bud. 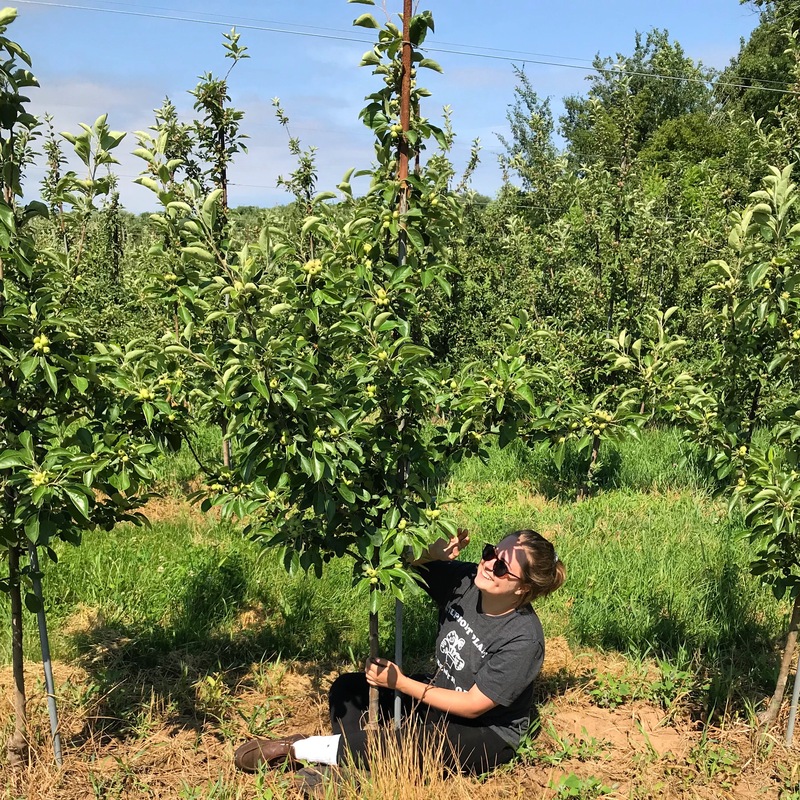 One research trial that has preceded my time as an intern, focuses on thinning trees down to 3, 6, or 9 times the fruit as the tree’s diameter, measured 12 inches above the graft union (the spot where new growth of trees are grafted onto their rootstock). There is also a category of trees that is thinned down to 0 fruit, or left unthinned. The Orchards staff and my fellow interns have spent long hours counting fruit, thinning fruit, counting, and trying to reach a specific, total number of fruit per tree. This will allow the researchers to note the number of fruit remaining in subsequent years, so they can allow producers to time their chemical thinners to a specific time. 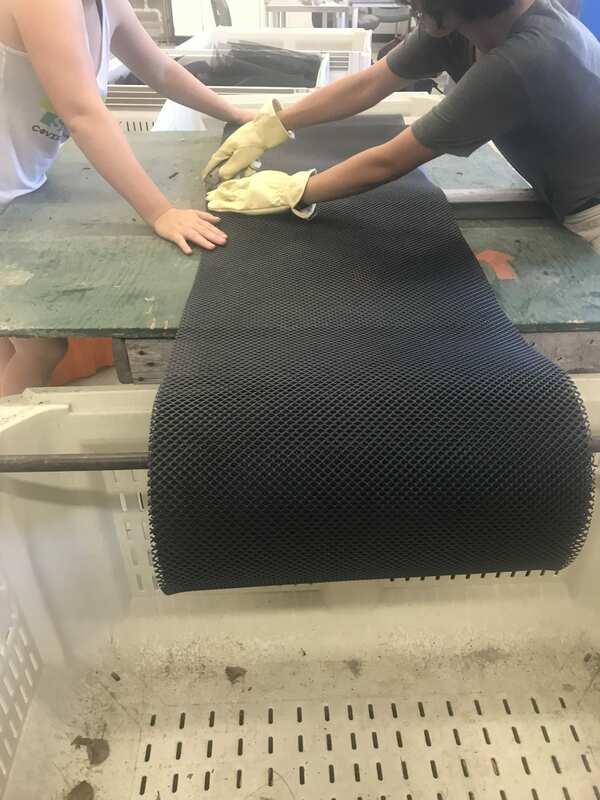 Here is an image of us diligently working on the project with staff at Cornell Cooperative Extension. 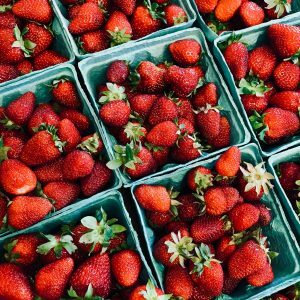 While it may seem simple to thin fruit, it took many hours to achieve perfection on this research project. 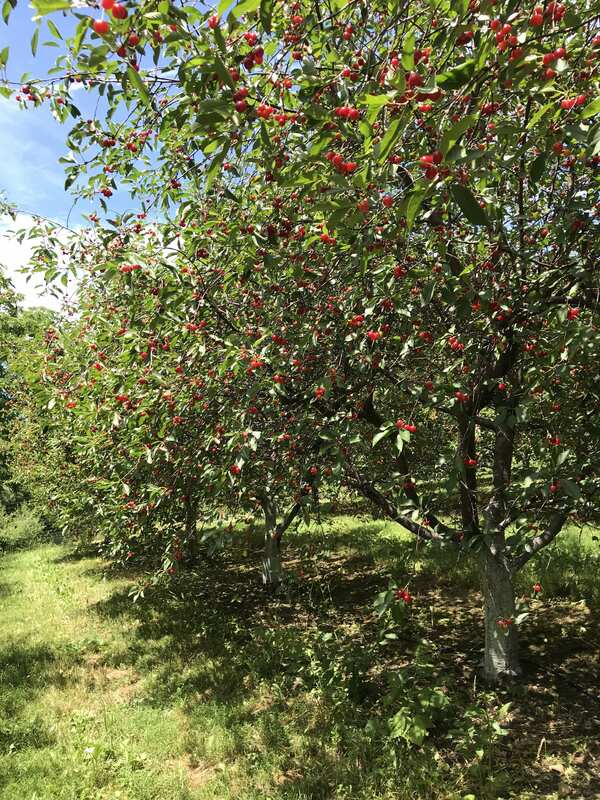 During my time at Cornell Orchards, I’ve learned about management systems for a variety of fruits. 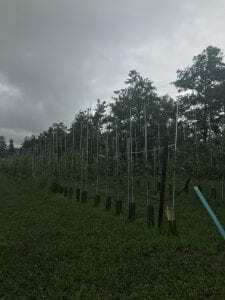 One of the newest fruit systems in the Orchards are UFO and KGB cherry training methods. 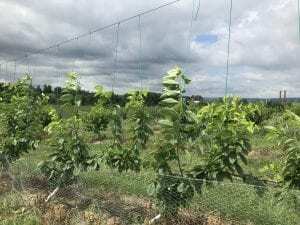 When left to their own defenses, cherry trees can grow to heights that make the tree harder to harvest and less efficient in fruit production. 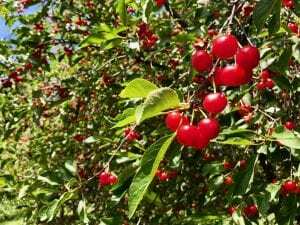 Without management, cherry trees have a central leader, have strong apical dominance, and can take years to produce a fruit crop. 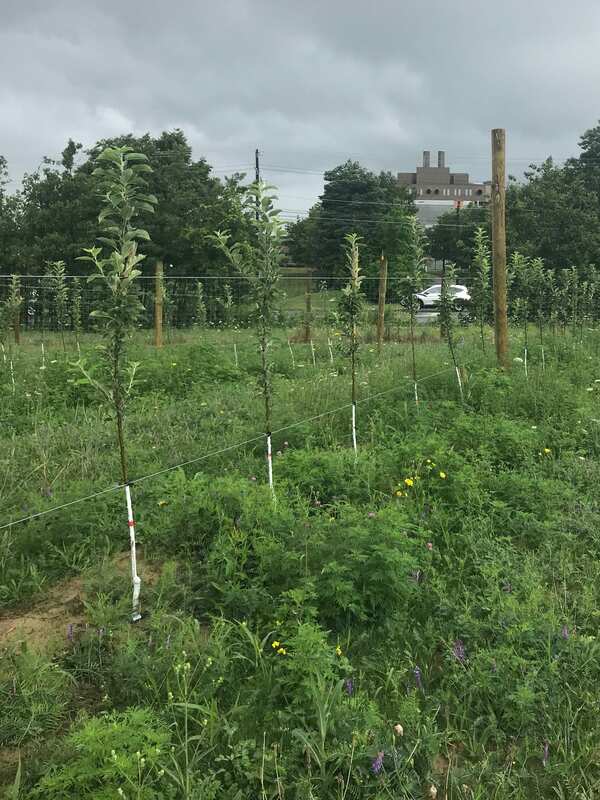 To combat the problems of natural cherry tree growth patterns, faculty at Cornell Orchards have planted cherry trees to be managed in Upright Fruiting Offshoot (UFO) and Kym Green Bush (KGB) systems. 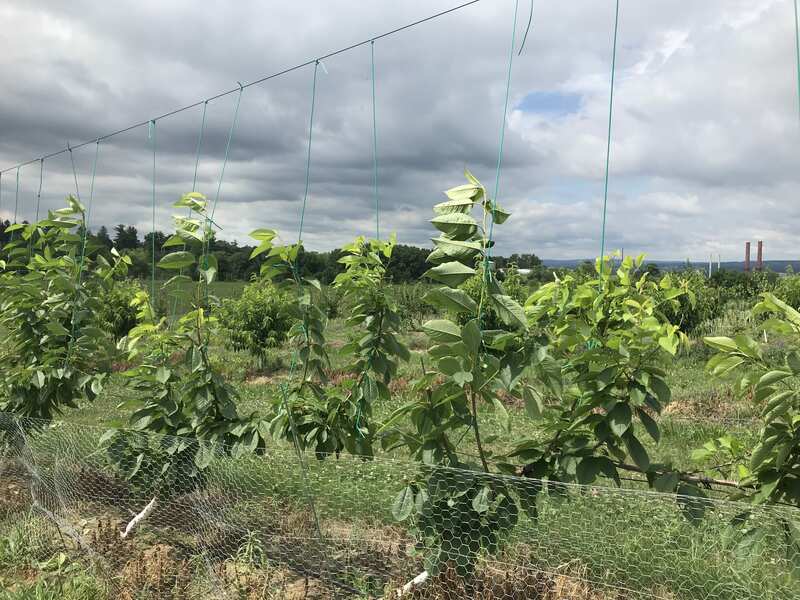 These systems allow the trees to be planted in higher densities than natural growth systems, and allow for fruit to be located more conveniently for pickers. The trunk is trained and tied down to a lower wire, and each shoot is tied upwards with rubber wire to a top line. With this system, we used rubber to tie the branches upright instead of wire. 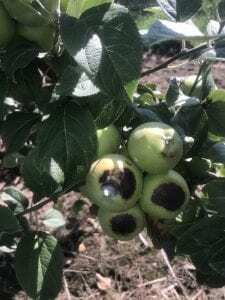 This was done because cherries and other stone fruit are susceptible to bacterial canker. This disease can fester through cuts during wet weather, and the rubber may prevent wounds in branches. The other system we have at the orchards is the KGB system. 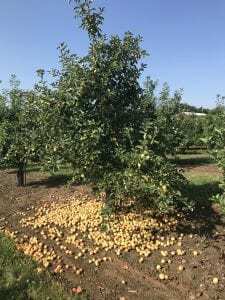 Here is one of the trees at the orchards that was trained in the KGB system. 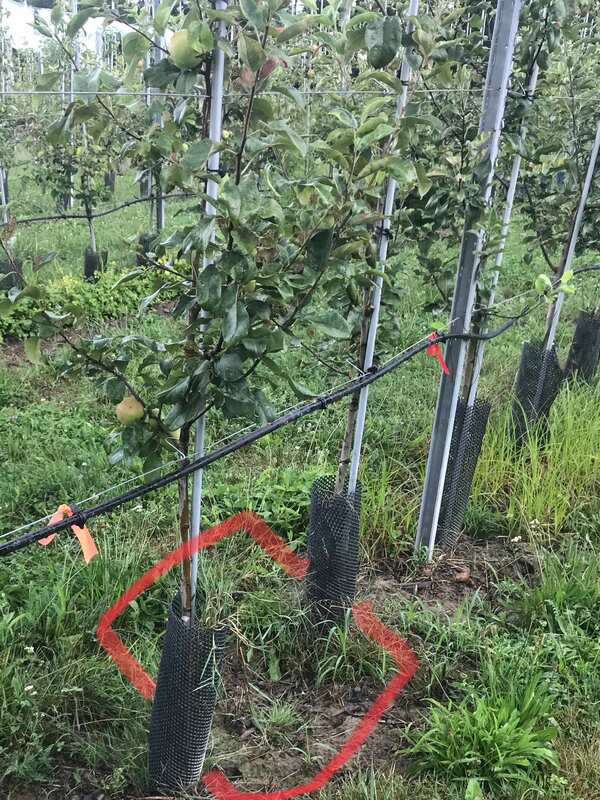 In this system, the shoots are pruned regularly to keep the tree bush height. This keeps the vigor of the tree low, and keeps all fruit at eye level or lower. 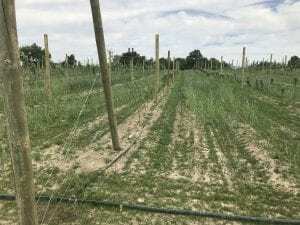 KGB pruning keeps shoots productive and efficient for fruit growth. One of the best parts of this internship has been quality control and taste tests on the amazing cherry crop! They tasted just as good as they looked!